Can I view my accounts and my client’s accounts separately? 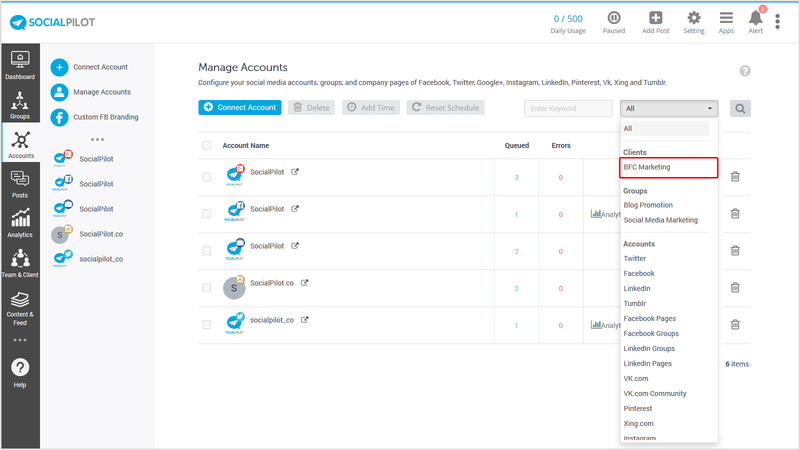 SocialPilot allows you to view a particular client's accounts separately. This feature helps you avoid confusion, especially when you are managing accounts for multiple clients. Log into the SocialPilot panel. Invite your client to connect his/her social media accounts. As the client connects his/her accounts. They will automatically appear on your list of accounts. Now, if you want to see a client's accounts, click on 'Accounts' -> Manage Accounts. From the drop-down menu in the right corner, click on your client's name and then, click on the search button. You'll see all accounts connected by that client. This way you can avoid any mistakes in scheduling posts for accounts of different clients.